Home PR PolicyAdvertising	Yummy in my tummy! I have summer on the brain. Maaaaybe it’s that little trip to Disney World on the horizon or the sunshine that keeps creeping into our breezy spring days, but I am ready for some summer food y’all. I love the mix of warm burgers on the grill with a big ol bowl full of fruit! I’ve already been scoping out some yummy summer treats and I can tell you, this is just the beginning. I love using COOL WHIP Whipped Topping in just about any dessert I can. It always makes it better. Granted, we don’t always have it on hand, but man it sure is a treat when we do! 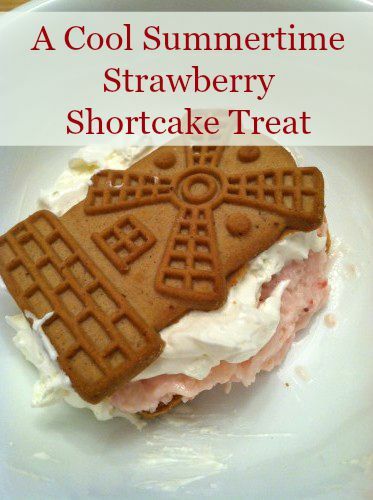 I give you Strawberry Shortcake to go! Disclaimer: This treat would actually be terrible “to go”. However, it’s quick to make so that is where you save time! Ok so the easy part: freeze some strawberry yogurt. You can use regular frozen yogurt too, but I just put a little tub of the breakfast variety yogurt in the freezer. 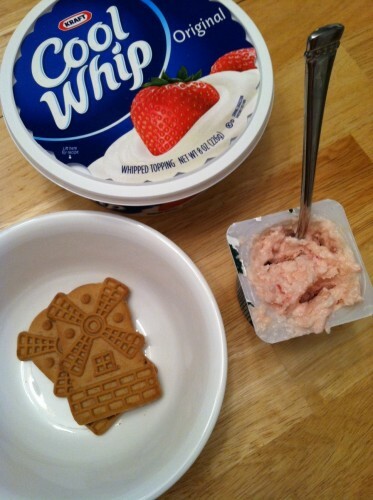 Once that is frozen you just grab a couple cookies (mine are almond) and scoop a dollop of yogurt with a dollop of COOL WHIP into the middle for a delicious little sandwich! That counts as a recipe right!? Maybe? I promise you, it’s soooo good! When cookout season hits, it is ON. I can’t wait to try out some other recipes new and old. I have a few favorites up my sleeve like this awesome pound cake I made a couple of years ago. I think we need a revival of sorts up in here. Yes. What’s your favorite way to use COOL WHIP? I need more inspiration! Looking for more summer recipes? It’s a great time to try one of these 5 popsicle recipes. Then here are 29 Cool Summer Desserts: Recipes That Are Tasty, Quick & So Easy To Make!